In my day-to-day world, I realize that I’ve always got my creative radar up– boring, normal days can become a lot more fun when creative juices enter in. This week there were a few events that -just made me happy. Pretty simple- but creative. And that counts a lot in my book. 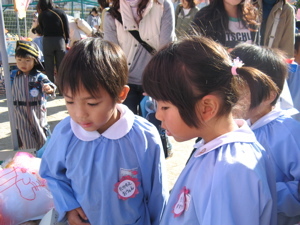 Event 1: Wednesday was a special morning at Owen’s school – it was called miseyasan-go-ko. Parents came to school, and we went “shopping” with our children. 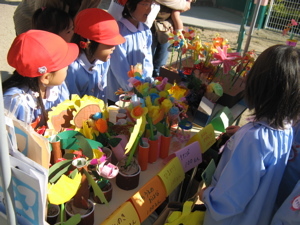 All of the classes had spent the past few weeks making fake items to sell to each other. (Only the third-year students were the store-keepers). Each child was given ten paper money bills (that they had colored themselves); and put them in their specially-made paper wallets. Then they could go around and fill their bags with the goods that they bought. I was really amazed at the fun foods, flowers, and goods that these 4, 5 and 6 year olders made from plastic bottles, yoghurt containers, and milk cartons. 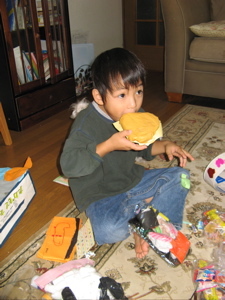 Below: the flower stand; Owen’s sushi lunch; and Owen “biting” into a McDonald’s hamburger. 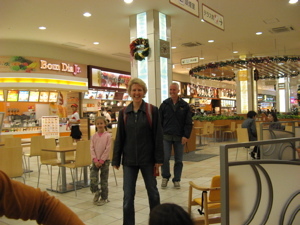 Owen chose Suzuka to go around shopping with. Her family has become friends with us- we loved watching them enjoy this time together. 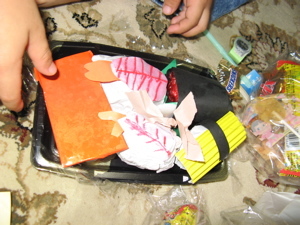 It was all SO creative- so much more fun than real things to buy. Owen’s still enjoying his paper sunglasses; super-power helmet; and bowling game that he brought home. 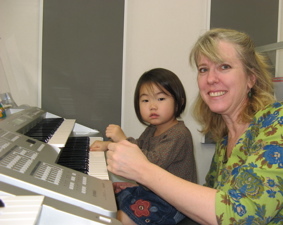 2) I left Owen’s school with Annie to take her to her first Yamaha music class. I signed her up with two other community moms and their 3 year old daughters. 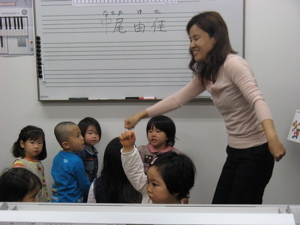 I wasn’t really sure what to expect in this class for three year olds, but was pleasantly surprised by the ability of the music teacher to hold her attention for an hour. 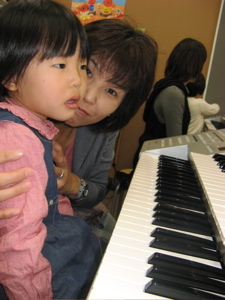 We were sitting at electric keypboards, and the moms and children were taught lots of songs with hand motions, clapping, and singing. They aren’t going to be taught actually how to play it, but they play ON it. We did a song with ants running (one little finger played on the keyboard)…then snakes slithering…then crabs (two fingers)..and finally elephants stomping (you can imagine). Annie had such a great time, and came home and told Owen all about HER school. 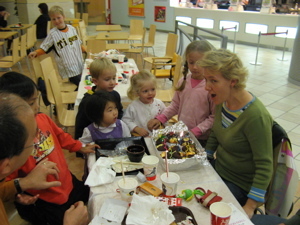 3) Finally, it was fun last night to celebrate our friend Wendi’s birthday last night in a very simple, but somewhat creative way… Her family came to the mall food court for dinner, as is their normal Friday night ritual…but our family was there waiting to surprise her a bit! 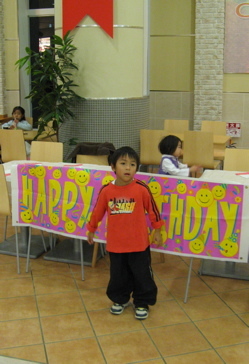 We had set up two tables with table clothes, banners, and napkins. Owen and I made my mom’s famous recipe for black-bottom cheesecake cupcakes, and we celebrated Wendi. We stood out a bit, but we loved being with our good friends, and eating happy meals, fried squid, and fried octopus treats together. A little bit daring – a touch of creativity– and I’m happy. (I hope Wendi was too). Happy Birthday, Wendi!